Just to mention, "migratory birds", is an autumn kigo in part because migrating birds arrive in Japan from Siberia to winter. They also depart in the spring, but in the culture of kigo, migrating birds migrate only one way, in one season, as far as the kigo wataridori is concerned. Canada geese, like many other birds, winter in the Chesapeake Bay and surrounding areas. 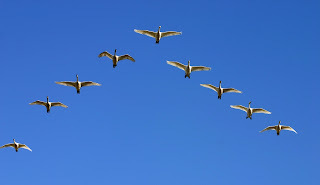 We are the southern end of the migratory route for these birds, so we have them in reverse. This is one of the things that makes the Chesapeake different from much of the Northern Hemisphere: They arrive in fall and go home in spring! Swallows and wild geese are said to leave around “Little St.Mary’s” (Nativity of the Virgin Mary, Sept.8th), storks and cranes somewhat later. This humorous autumn hokku is from the 9th month (October) of 1822. Various kinds of migrating birds are now heading south for the winter, stopping for a day or two at places along their route. Birds didn't winter in the snowy area in which Issa's hometown was located, so these birds are just passing through. When a flock lands it temporarily takes over a bit of new territory and ignores the local residents. Rice has recently been harvested, so some birds are probably going after all the grains they can eat, while others feed on people's hedges and in their gardens, causing people to greet them with shouts and expletives. Issa is amused by how cool and nonchalant the birds are. They seem to have experienced so much criticism from humans that they don't respond to it anymore. The word "even" implies the birds are cool and unfazed by everything on their trip, even the tongue-lashings they get from humans. As a fellow migrant bird, the well-traveled Issa seems to sympathize with the birds and understands their need to stay calm and cheerful on their long, hard journey. There may possibly be a reference here to Issa's treatment by many of his fellow villagers in his hometown. He wasn't bawled out, but he was criticized by some villagers as an outsider selfishly trying to force his way back into a village where he was no longer welcome. He seems impressed and heartened by the lively equanimity shown by the birds. [NOTE: The following sequence was triggered by the publication, in the “National Geographic” magazine, of a map showing the impressive distances covered each year by migrating birds around the world. Already published in “Haiku Harvest”-]. A birdwatcher in Japan has reported a rare sighting of an endangered konotori, or oriental white stork, in a field in the northeastern prefecture of Yamagata. The stork was seen on Thursday morning, standing in the rice field in Tsuruoka City and slowly flying above. The wild bird is designated as a special national treasure. It was believed to have disappeared from Japan in 1971. Konotori-no-Sato Park in Hyogo Prefecture runs a program for artificially breeding the endangered species. About 80 storks are now believed to inhabit in the country. A researcher at the park said the stork may have come from China or elsewhere or been born to parents released in the program as it did not have a leg ring. An official at the Gassan Visitor Center, a natural observation facility in Yamagata, said he was excited to get a rare view of the bird.